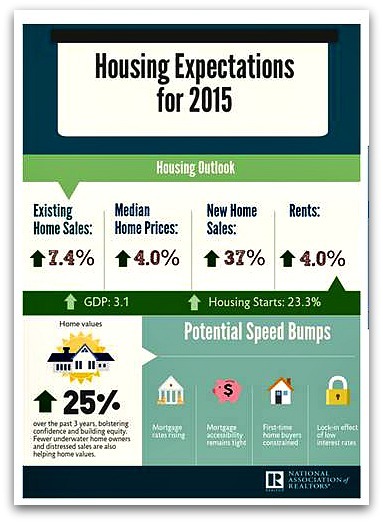 The National Association of Realtors released an infographic detailing the 2015 national housing market. But real estate is local and greater Cincinnati is still suffering from a severe shortfall in the number of homes and condos for sale. And while mortgage rates continue to remain low-only buyers with good credit ratings reap the benefits while some borrowers still struggle to meet to get a loan. Renters, with good credit, are finally beginning to weigh the cost effectiveness of renting vs owning as the cost of rentals jumps. What are your thoughts about the 2015 housing market?